Safest California Cities - How does Palos Verdes rank? Did you know that the 2017 Safewise.com report shows Palos Verdes areas in the top 50 safest California cities? In fact the city of Rancho Palos Verdes has organized a Ring event! The City of Ranch Palos Verdes and Ring have teamed up to offer an exclusive discount on their three main devices! The City of Rancho Palos Verdes allocated $100,000 in funding in order to provide Rancho Palos Verdes residents with this discount. This program will run until July 31st, 2017 or until funding expires. Video Surveillance devices are a useful tool in the Sheriff’s Department crime prevention and crime solving efforts. The City of Rancho Palos Verdes would like to invite residents to attend a Ring Meet and Greet event on Saturday, July 8th, 2017 from 10:00 AM to 3:00 PM at Hesse Park. Please note that this discount is only available to Rancho Palos Verdes residents who show valid proof of residency and complete a Resident General Release Agreement. 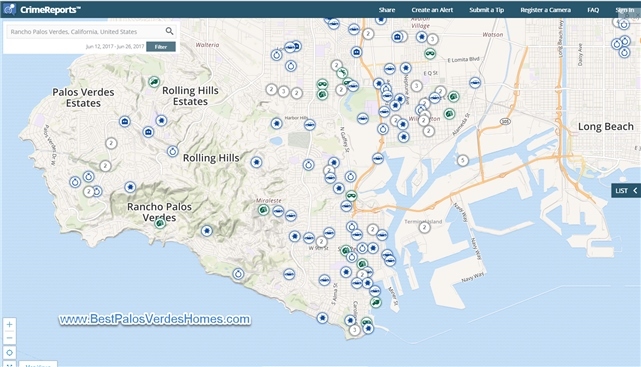 Residents will be able to purchase one Ring camera for a special Rancho Palos Verdes price! The Ring Video Doorbell and Stick Up Cam will be available for $99 and the Ring Pro will be available for $75 at the event. Residents can opt to purchase an additional two Ring camera products for $50 off. An additional Ring Video Doorbell or Stick Up Cam will be $129 and the Ring Pro will be $199! Ring will also offer a discount on select accessories. The Chime Pro and Solar Panel will be available for $34. Ring representatives and City Staff will be available to answer any questions about the program, available devices, and public safety questions. Major credit and debit cards will be accepted as the form of payment on site. Please RSVP by Thursday, July 7th, 2017, to Jacqueline Ruiz, Administrative Analyst in the City Manager’s Office, at (310) 544-5305 or jruiz@rpvca.gov.